More impressive than his speed, however, is the grace and efficiency he brings to bear in his playing. Even at his fastest, the pianist displays a profound regard for touch and dynamics, for rhythm, and the ebb and flow of musical phrases. His thorny, decidedly nontonal approach might distract one from the essential jazz elements of his playing, but listen to his contours and textures, the variability of his touch. Like Earl “Fatha” Hines, jazz’s first great pianist, and Bud Powell, the sine qua non of bebop piano, Bergman digs beneath the keys and uncovers the music within. Since Bergman began his recording career in the mid-1970s-then in his 40s and a fully formed free-jazz virtuoso-much has been made of his formidable technique, especially the extraordinary dexterity of his left hand. 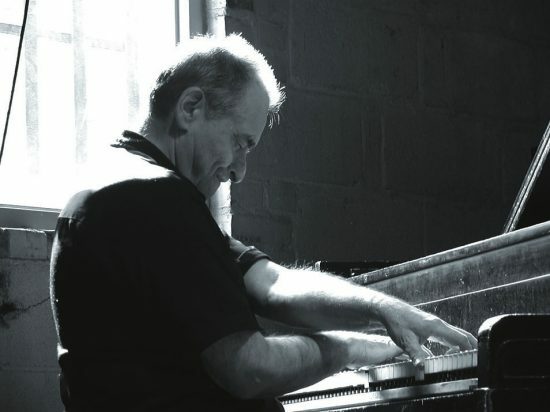 Less has been said of his total musicality and his connection to the jazz-piano tradition. His manner of phrasing and articulation and his relationship to rhythm place him solidly within the continuum of great jazz pianists. So does his commitment to pursuing a unique musical vision. Borah Bergman was born in New York City on December 13, 1926, a son of Russian immigrants. His family was musical: his mother sang and played piano, his sister was a folksinger and his father played the mandolin. “On my mother’s side, everybody was in-tune with music,” Bergman says, “some of them were professional-they played piano, played violin, sang, stuff like that.” His father was a dentist by profession, but played mandolin on the side. “My father was very analytical, always making lists of things to do-he reminds me of myself. He actually played in a mandolin orchestra. My mother used to play harp sounds on the piano when I was going to sleep, by Weber or somebody. I used to hear Bach all the time. When I was a kid, I think it had an influence on me.” One female cousin was a cantor. Another cousin, pianist Sammy Prager, played piano with bandleader Ben Pollack in the early 1920s, in a band that also included Jack Teagarden and Benny Goodman. Prager went on to become actor Danny Kaye’s accompanist. “I’ve still got an old folio of his around here somewhere, 50 Licks by Sammy Prager,” he laughs. From age 14, however, Bergman’s main instrument was clarinet. He studied with the renowned instructor Leon Russianoff before being inducted into the Army, where he played in a band among other duties. “When they took you into the Army, they gave you these tests to see what you were good at, and guess what I scored through the roof on? Morse code. I guess because I was musical or something. I figured they’d put me in the signal corps or something. So where did they put me? Tanks!” he laughs. While he was playing out, he wasn’t recording. “First of all, there weren’t many record companies in the ’70s. I mean, today a kid can go and make a record in two seconds. You couldn’t do this in the ’70s. I didn’t really know how good I was. Then I met Hank O’Neal,” who runs the Chiaroscuro label. A fan of traditional jazz, O’Neal nonetheless recorded a few avant-garde players of the era, including the baritone saxophonist Hamiet Bluiett. In 1975 he offered to record Bergman. “He must’ve heard some-well, I think there’s still some stride in my playing,” the pianist says. Bergman went into the studio immediately after one of his idols, Earl Hines, who was also doing a record for Chiaroscuro at the time. “Luckily, he left some of his energy in the keys for me,” he says. Bergman remained based in New York, but he would tour and teach in Europe throughout the ’80s. He went on to record seven more albums for Soul Note. The first several were solo recordings, but in 1990 he recorded The Fire Tale with soprano saxophonist Evan Parker. Bergman then began collaborating with other top-drawer saxophonists: Roscoe Mitchell, Oliver Lake, Thomas Chapin, Peter Brotzmann and Anthony Braxton, among them. Since 1990 he’s been the leader or co-leader on 20 albums for a variety of record companies. His latest, Acts of Love (Mutable), features the veteran British musicians Lol Coxhill on soprano sax and Paul Hession on drums. “I decided to call it Acts of Love, because I really feel that in the music,” Bergman says. The three men certainly share an extraordinary empathy. Bergman’s affection for Coxhill is evident. “Lol Coxhill, he will blow your mind,” Bergman emphasizes. “He has the greatest sense of humor, is totally unpretentious.” Coxhill’s playing bears that out. There’s nothing at all comical about his playing, but there is a palpable warmth and good humor. Coxhill is a master of the subtlest aspects of playing soprano. Like Bergman, he has the chops to play fast and hard, but he also has the innate musicality to know when to bring things up and when to bring them down. There’s an almost compositional logic to these improvised performances. Forms evolve organically. Motives are established and shared; intros performed by the full ensemble give way naturally to solo passages, which might in turn melt into duos or more solos, followed by a return to the trio. Hession is the perfect drummer for this group, a sensitive accompanist who is well capable of interacting on equal footing with Bergman and Coxhill. Bergman’s playing encompasses unsentimental lyricism and raw aggression, and every shade of gray in between. His fast playing is intricate but never ornamental; every note sings, no matter how quickly it may pass from hearing. Bergman connects with Coxhill perhaps more profoundly than he has with any other musician with whom he’s recorded. Acts of Love is on par with the best work Bergman has done. All that practicing has made Bergman into something much more than just the fastest gun in the west. It’s allowed him to express himself as clearly as an artist can. And while he’ll always venerate giants like Hines and Powell, in the end, it’s the cultivation of his own voice that concerns him most. “Originality is the great equalizer,” he says. “If you’ve got something of your own, do it.” It’s what the greats have always done.